Microsoft has announced that its first flagship store in the Asia Pacific region will be located in Sydney, a mere street away from the Sydney Apple store and Samsung store. Opening in late 2015, Microsoft's new retail home will be located in Westfield Sydney on Pitt Street Mall, stocking a wide range of Windows PCs, Surface devices, phones, Xbox One and Office products. Both Apple and Samsung have stores situated on George Street, just around the corner from their tech rival. Pip Marlow, Managing Director of Microsoft Australia, says the new outlet will also offer "the same outstanding choice, value and service as our stores overseas and online". As well as selling tech, customers can also visit the store to use the Answer Desk for troubleshooting, support and hands-on guidance with products and software. 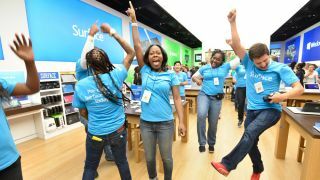 The store will offer more than a place to try out and buy new tech, as Marlow says Microsoft is "also committed to being part of the fabric of the local community." "We will regularly donate volunteer hours, host community events, offer training workshops, support science, technology, engineering, and mathematics (STEM) education and build deeper relationships with our customers, one person at a time. The space will be as much a place for engaging experiences as it is a retail store." Microsoft should have plenty of space for sales and support, as the Pitt St Mall business is spread over two floors encompassing more than 6,000 square feet and will be located next to Sephora and the main entrance of the mall. In September last year, Microsoft announced its first flagship store on Manhattan's prestigious Fifth Avenue, and is expected to open in 2015. The Sydney store joins 110 physical stores in the U.S., Canada and Puerto Rico and 17 store-in-store locations in China.